At the Trials Workshop, you'll learn how to work through challenges and progress yourself to the next level! This is an intensive training led by a professional freerunner that focuses on essential and unique movements to go from point "A" to point "B" in all directions. You'll be working on moving through space using traversing, ascending & descending techniques, intricate climbing patterns and foot-placement drills. 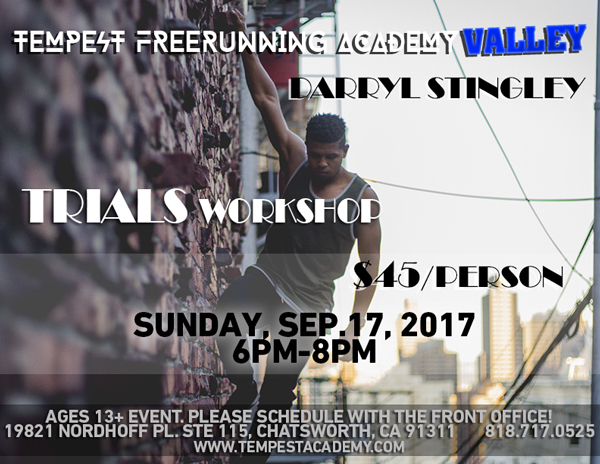 Come through and learn from Darryl Stingley! or CALL NOW to reserve your spot! !